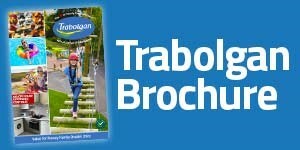 Trabolgan has everything you need for a fantastic self catering holiday! Holiday makers looking for a value for money short break or family getaway, will be delighted to hear there are some fantastic holiday offers available at the East Cork venue for the 2019 season! Trabolgan has everything you need for the perfect family activity holiday; or if you wish to relax and unwind, Trabolgan is the ideal location for a short break, to pamper, de-stress and refresh. Check out our fantastic range of 2019 self catering breaks. Book TODAY to avail of our amazing discounted prices! When you check in for your holiday you will receive a copy of our 2019 money saving offer booklet, with fantastic money saving offers of over €250 per house on a variety of on park facilities. As part of our continual upgrade and investment programme there will be exciting new developments on park for the 2019 season! Click for more! Click to book now or call our reservations team TODAY on +353 (0) 21 4661551 to book your 2019 getaway TODAY! *All offers are subject to availability at time of booking. Cannot be used in conjunction with any other offers.